I’ve walked that tightrope a time or twenty. Even being told by many that God would do this or that big thing in my life, but growing impatient waiting and willing for it to happen, meanwhile fearing that my offerings amounted to little more than a widow’s mite. Sometimes being used by God isn’t the big things like speaking from stage or praying for healing for someone or writing a book. 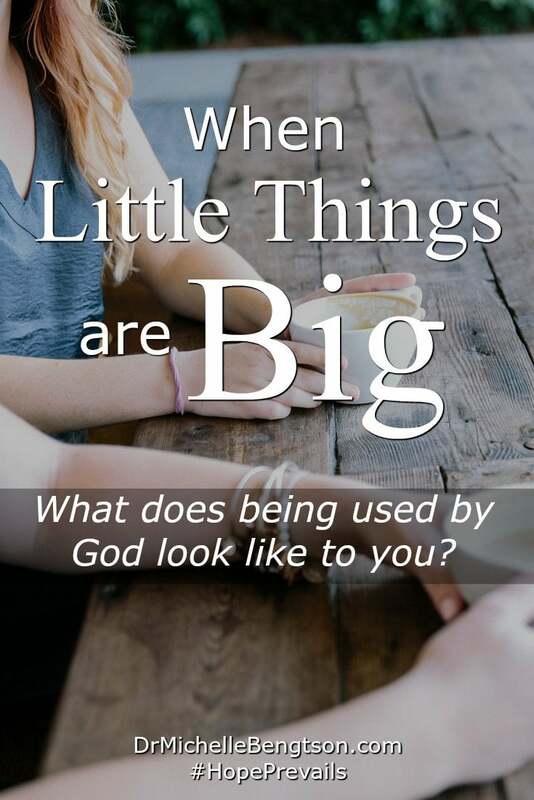 Sometimes being used by God is the little things that no one sees like picking up trash on the side of the road, holding a door open for a line of people when you think you need to be in a hurry to get to where you needed to go. Sometimes being used by God means being willing to set your technology aside, look someone in the eye, and listen while they pour out their pain. Sometimes, used by #God means you lay down your phone & look someone in the eye. 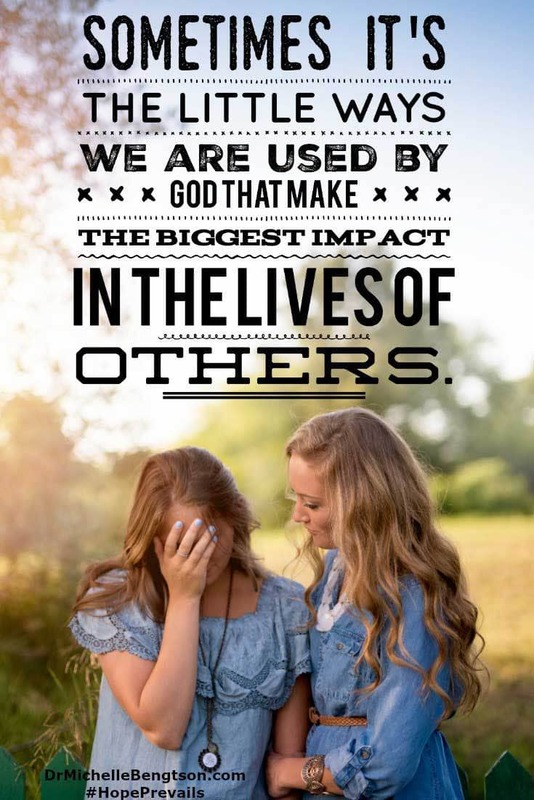 Sometimes it’s the little ways we are used by God that make the biggest impact in the lives of others. Scripture says that if we want to be entrusted with much we must be faithful with the little things. Open yourself up to being used by God today, however He sees fit. Have you entered the drawing for the Book Giveaway? 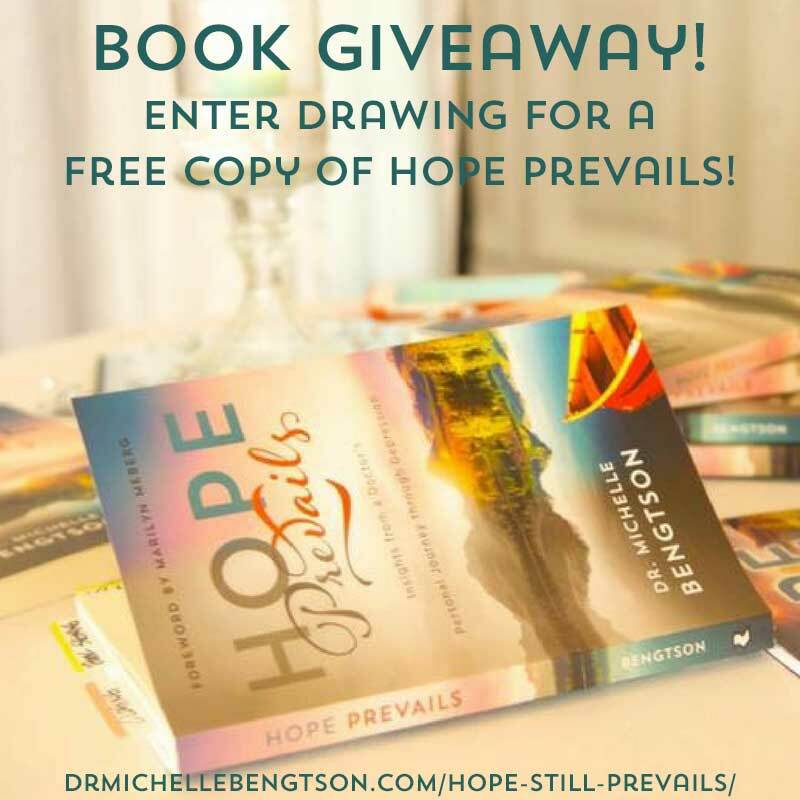 If you’ve struggled with depression and need to know there is hope, leave a comment in the Hope Still Prevails blog post to be entered into a drawing for a chance to win a free copy of Hope Prevails. The drawing will be held on 8/23/17. Tx Dr Michelle. I enjoy your daily articles. I’ve suffered with back pain for over 40 years and have tried everything to alleviate it. It truly gets depressing but I still believe God will ‘fix me’ one day. Just hope I can keep on keeping on. Dear Peg, I felt compelled to reply to you. I never do this but there is conviction in my heart. God is more than willing to heal your back pain because Jesus provided a way to do that. His blood forgives and heals at the same time. Take heart! It’s not that He may do this “one day”, it’s actually available now, present. Pray out the healing scriptures. By His stripes I declare in Jesus’s name, you are healed! Getting a nice comment picks me up when I don’t think many people are reading my blog or I’ve one of those days. Praise Him Who works in us and through us for His glory! It is so true, Michelle. Often what appears to be small in our eyes is huge in the lives of others and can make the biggest impact. Wonderful post. This really does hold true so much, Michelle! We don’t always realize that what we do or say can be a great thing to others. So true, Michelle. We never know the impact of the little things we do. Thank you for the reminder! Michelle, what a great post! 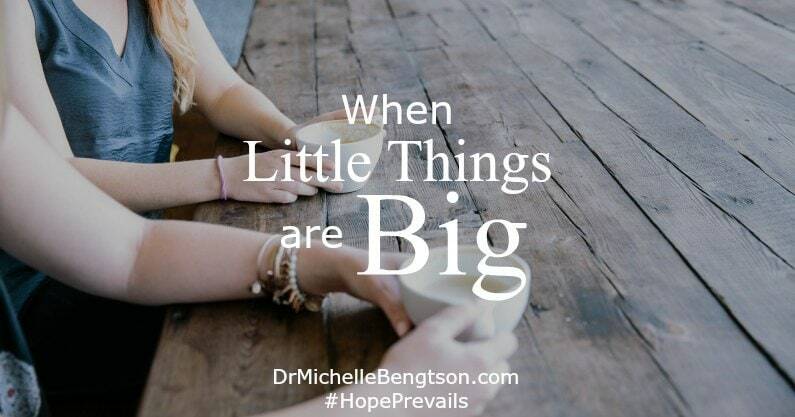 Such wonderful encouragement to be on the look-out for the small gestures that add up to much. Many blessings to you! It’s the little things that truely add up in our Faith Walk! Thanks for sharing Michelle! I appreciated reading this today. I love to write but I’m just not sure I’m meant to “Speak.” Sometimes it makes me question myself when I see so many other women doing those “big” things. But I love how God leads us each on our own path. We’re so good at comparing ourselves, aren’t we? Even though God warned against it, it just seems to be part of our DNA. Thanks for reminding us of what really matters … doing whatever God wants us to do.